My mom makes the best French Canadian style meat pie. I’ve been after her for years to teach me her tourtière recipe. She’s been making meat pies for Christmas for as long as I can remember. Each year in late November or December she spends a day in the kitchen, with her tall metal stock pot, cooking homemade tourtières. When I was a kid she would set aside an entire day just for making meat pies. She would make up a dozen pies or more. We would eat one pie for dinner that night and the rest would go into the freezer. My mom would keep a few in the freezer for a quick dinner for nights when she didn’t feel up to cooking a big meal. And the rest would be given as gifts to neighbours, family and friends. A couple of years back I asked my mom for her recipe. She looked through her kitchen drawers and discovered the paper with the recipe on it was long gone. She’d been making meat pies from memory for decades, constantly tinkering with the formula, or “just using what was on hand”. She couldn’t rattle the list of ingredients off to me. She tried, and it sounded more like a flow chart. If this, then that. So for the past year or two I’ve been asking her if I could come over and cook meat pies WITH her, and this year we finally made it happen. We spent the entire day in the kitchen, drinking cups of coffee, listening to Christmas tunes, singing, talking, laughing, and even at one point playing Scrabble while we waited for the pies to bake. I asked questions and took plenty of notes as we put the pies together, step by step. We started off by browning the meat in a large stock pot. 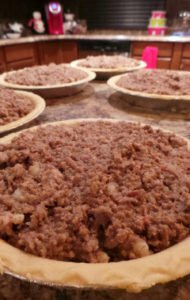 We used a mix of beef and pork, about one and a half pounds per pie, and roughly half of each type. My mom explained how traditionally French Canadian meat pies are made with veal. she told me that she used to use veal in the pies, but decided they tasted just as good without, and besides using just ground pork, or a mix of ground pork and beef, was cheaper. We added beef stock and coffee to the stockpot full of ground meat. This was the one variation I wanted to make in mom’s recipe. Van Houtte had sent me some of their seasonal beverages, along with a recipe booklet showing their twist on a few holiday classics, including mini tourtières made with their Holiday Blend coffee. Normally my mom would just use beef stock. I wanted to try using coffee. We compromised and went half and half. The end result was delicious, and my mom totally agreed with me when I said that I think next time we should ditch the beef broth and just use coffee. We were aiming to make eight pies. So it was about twelve pounds of ground meat total. It was really hard to stir at first. I worried about everything browning evenly. I wondered if we shouldn’t have browned the meat and then added the liquids. My mom said, “No, no, you do it this way.” I suggested browning the meat in batches, mom told me she used to do that, but had discovered this way was much faster. Sure enough, she was right. After five or ten minutes everything started to cook, and become much easier to stir, break up and mix together. While the meat browning we started on the bacon. We cut up two packs worth, tossed it into a skillet, and cooked it “low and slow” until it was all crispy. Once the bacon was crispy, right through, we added it to the stock pot, using a slotted spoon and leaving the bacon grease behind. My mom then dumped off about half of the bacon grease, putting it into a clean jar to use for cooking other things on other days. We added diced onions to the remained bacon grease and fried it until it was soft and translucent. We transferred the onions to the stock pot. We also added a mix of spices; cinnamon, salt, clove, nutmeg, and pepper. We gave everything a good stir, and left it to simmer on low while we finished peeling eight pounds worth of potatoes. We cut the peeled potatoes into chunks, boiled them for twenty minutes, and then drained and mashed them. My mom pointed out that it was important not to add butter or milk to the potatoes while mashing them. “You want dry potatoes that will soak up the liquid from the meat mixture.”, she explained. We added a bit more than half of the mashed potatoes to the stock pot and took turns stirring, and stirring. We added a bit more potatoes, and a bit more, until the filling was a thick consistency, “like turkey stuffing”. At that point the filling was ready to go into the pre-made pie shells, which had been defrosted in the fridge overnight. We filled each pie, levelled it off, and added a top crust. We used deep dish pie shells because that’s what happened to be on sale when we hit the grocery store the day prior. Two pie shells per pie, one for the bottom, one for the top. My mom told me about how she long ago stopped using homemade crust, because the frozen premade stuff was “just as good” and it meant it now took less than twelves hours to throw her pies together (we started around 2pm and finished around 2am, but we took a break in there where I went home and fed my kids dinner and put them to bed, and then came back to finish up). She showed me how to moisten the pie shell with water, so that the two layers will stick together. She showed me how to “flute the crust”, just like her grandmother used to. We also took the little bits of left over dough, rolled them out and turned them into a “sugar dog”, like we used to do when I was a kid. Then we baked the pies, three at a time (that was as many as would fit into my mom’s oven) and set them aside to cool. Saving a few to eat fresh and freezing the rest. The end result was delicious. I’m glad I finally got my mom to share her recipe and so glad to know that I can make these on my own now (but am thinking I’d still be happiest spending the day baking them with with her). We made these the week before Christmas, and it was nice having this ready to heat up meal good to go for crazy nights over the holiday break. However I’d argue that tourtières are the perfect winter time meal, well beyond the Christmas holidays. I already used up the last one in my freezer, which is so sad, and I’m thinking I need to whip up another batch, pronto. 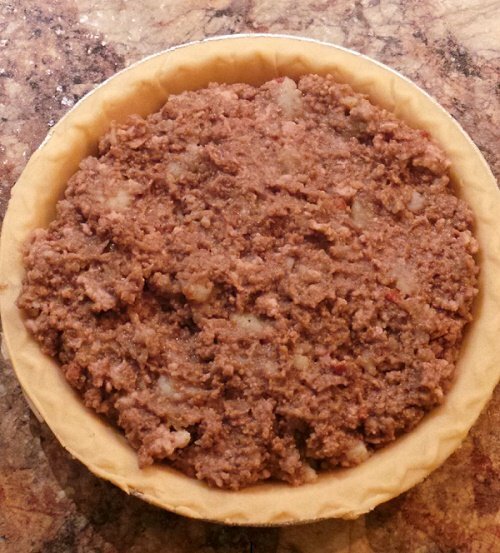 Classic French Canadian tourtière recipe, as handed down to my mom, and tinkered with over the years. Recipe can be scaled up or down, depending on how many pies you want to make. Amounts listed are to make 8 pies. Per pie suggestions are also listed. 8 lbs of potatoes, peeled and cubed (about 1lb per pie, recommend buying one of those 10 lb bags). In a large stock pot combine the ground beef, the ground pork, the beef broth and the coffee. Brown over medium heat, stirring frequently, until meat is fully cooked. At the same time, in a skillet, cook the bacon until crispy. Transfer bacon to stock pot with a slotted spoon. Pour off half the grease. Add onions to skillet and fry until soft/translucent. Add onions to the stock pot. Add spices to the stock pot. Mix thoroughly. Put the potatoes in another pot, add enough water to cover them, bring to a boil, boil for 20 minutes. Drain and mash the potatoes ( do NOT add butter or milk). Add the mashed potatoes to your meat mixture and stir really well. The potatoes should soak up all the liquid, so that the filling becomes a thick, stuffing like, consistency. 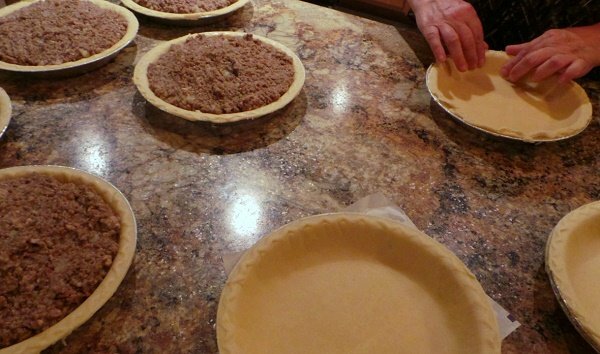 Fill half of the defrosted pie crusts with the meat pie filling (the other half will become your pie lids, so it works out to two premade pie crusts per pie). Dip your fingers into a glass of water and brush your wet fingers along the edges of the pie (bottom), then invert the second pie shell over top (removing the second shell from its pie tin). Flute the pie crust, pinching it together with your fingers. Or press the edges down with a fork. Cut a slit into the pie top to let the air escape (my mom makes patterns that look like Christmas trees or snowflakes). What about you folks? Have you ever tried to get a recipe from someone only to discover there is no real recipe? Have you ever made homemade meat pies? If you do give our recipe a try I’d love to hear about it! 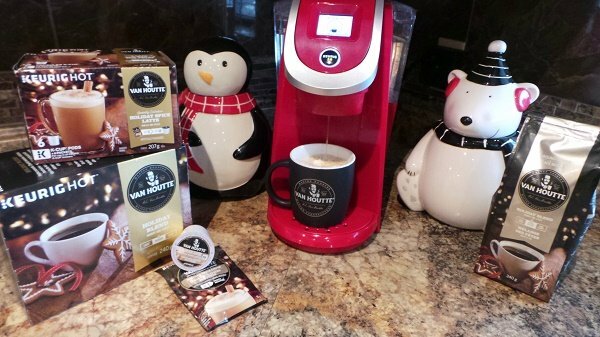 Disclosure: Van Houtte sent me some of their holiday beverages to sample. Looking at their suggested recipes made me want to try using coffee instead of beef in the meat pie filling. My words, my opinions, and my intense desire to learn how to cook tourtiere? That’s all my own. Thank you for sharing! I save it for next year. My mom was you add a little of this and a little of that and my pie were good but nothing like hers. I will try this recipe next Christmas. My mom made her meat pies the same way. She would make about 50 pies every year for Christmas and share them. Now I make them for my family and friends. Deanna, I love this post! Never miss an opportunity to spend a day cooking with your mother. How I wish I could still do that. This is just the way I got recipes from my mother, too. I remember many years ago sitting in the kitchen with her while she made her famous potato salad so that I could get it down on paper. 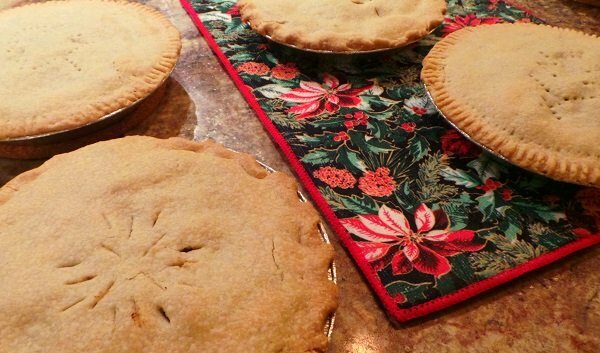 I posted my tourtiere (my husband’s half French Canadian) story in December. Your post has me craving it! Meals that our parents’ made when we were growing up are such comfort food now! I love makin. Those recipes! I’m impressed with the pastry! 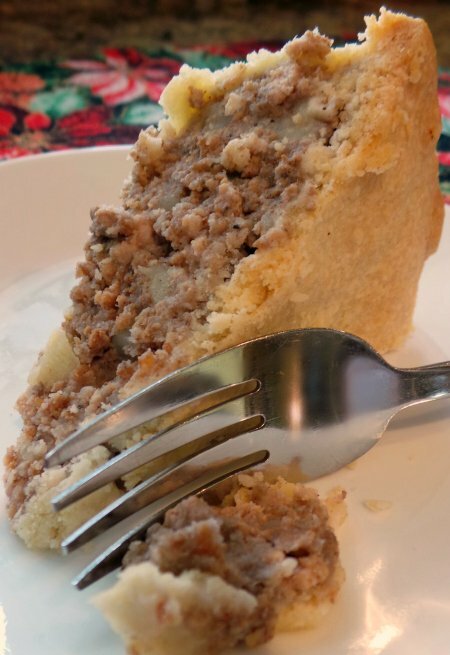 Oh my…I haven’t had tourtiere since I was in grade 4 French Club many, many moons ago. 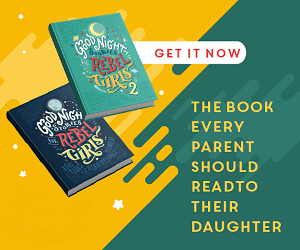 Your recipe looks delicious and I would’ve never thought of using coffee, good on Van Houtte for thinking of it and good on you and your mom for being the brave ones to test it out. I love that you and your mom got to spend a day making these special meat pies and it reminds me that me and my mom need to have a baking day sometime in the near future. I miss those! I love that you played scrabble as you baked with your mom. I get together once in a while to bake with my mom too and we usually have a game going on at the same time. The best memories being made. These are the best! I can’t wait to try out your mom’s recipe, sounds close to the one I currently use. This sounds so inviting. I would love to make this. Nothing better than mom’s cooking! These sound so yummy.I would love to try this recipe but would probably cut it in half.I like that you said you would use just coffee next time.It must have lots of good flavors.Thank you for this post. I tried this recipe and my family loves these pies.They are asking for them often now.Thanks for the recipe that we really enjoy. You know I have never tried a meat pie like this, it sounds really good. It’s a bit of a fuss to make, but totally worth it. So much yum. Thank you sooooo much. My Nana use to make these every Christmas until she passed away. She also did not have a written recipe. I have tried many but they didn’t come close. By what I read I think this might be the one. Thanks for sharing. Oh boy, these pies look super yummy!!! Thanks so much for sharing your Mom’s recipe. Can’t wait to try it! Thank you for sharing. This looks so delicious! Thank you for sharing your Mom’s recipe. I was happy to finally get it written down and “saved”. This looks like a delicious recipe that I’d like to try. That is such an interesting recipe with ingredients I never would have expected! It’s not a traditional dish in our family but we’re are very interested in making it and didn’t know how. This is so helpful! This sounds like an awesome recipe, would love to try it sometime! !